Other scholars in this series: Dale Allison, Richard Bauckham, Scot McKnight. To appreciate the coverage of Dunn’s works see a selected list in Wikipedia. From what they saw and heard, viewers who lacked training in biblical studies or theology were unable to distinguish be­tween the weightier and the less weighty opinions. They were given too little advice as to whether what was projected was accepted by the majority of scholars in this field or only by a lone voice resisting the larger consensus. Of course, scholarship does not and should not pro­ceed by majority vote! One scholar in a hundred may be right, and the remaining ninety-nine wrong. But when lay people are being exposed to the claims of scholarship, they at least have a right to know how well these claims have been received by other scholars. British television offered a follow-up series in an attempt to give more moderate biblical scholars a chance to present their side of the case and to respond to the radicals. As a result the controversy was, if anything, extended and enlarged. Coming in conjunction with the heated debate that arose when a theologian with controversial views on the virgin birth and resurrection was consecrated a Bishop of the Church of England, thoughtful people—in and out of the churches— raised serious questions: Is the traditional faith of the church obsolete? Is the church not being honest with the public? Have such recent discoveries as the Dead Sea Scrolls and the Gnostic library in Egypt discredited the Gospel picture of Jesus as we have known it? Is the evidence not being candidly presented and discussed? In other words, the public was well and truly aware that most scholars did not accept views that radically questioned Christian origins. But what was under threat was public confidence in the intellectual integrity of the bulk of those theologians. Damage control was called for and James Dunn stepped in to do his part to bolster the confidence of the devout. One of the attractive features of Durham was an active Council of Churches, which Meta and I helped to revive . . . as Churches Together in Durham. 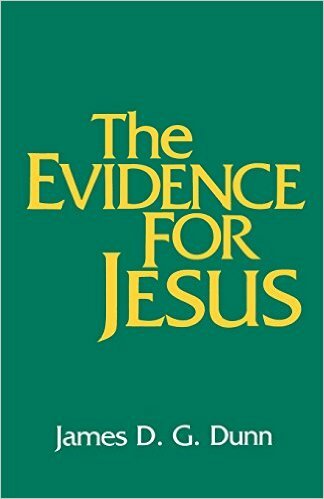 Initial involvement was a sequence of lectures in response to a London Weekend Television series entitled Jesus: the Evidence (1984), a series which had proved to be very unbalanced. The puzzlement and distress caused by the series prompted me to offer a four-lecture response, better rooted in the New Testament evidence and more truly reflected of the range of scholarly opinion. These were published as as The Evidence for Jesus. . . .